Summary: ■Triple acrylic resin coated imported steel surface. 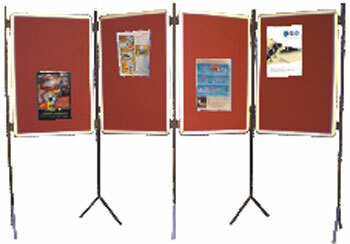 ■Longer durability than non - magnetic boards for daily usage. colour is available for writing with markers. ■Green colour for writing with chalk. ■Available in all sizes and can be customized also. ■Ceramic surface pleasures silky smooth writing. warranty on the surface under daily use. 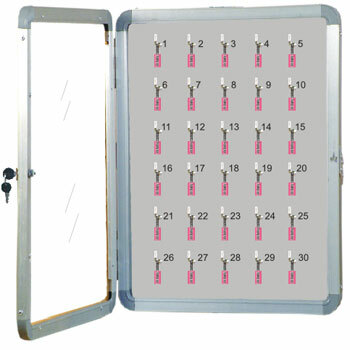 Semi Matte Surface can be used as OHP screens. ■Thickness of the surface being 0.40 mm, is totally crackproof and attracts magnets. 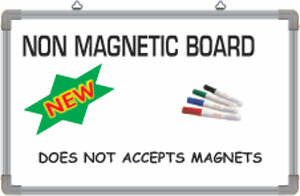 ■Longer durability than non-magnetic boards for daily usage. Smooth and glossy surface gives advantage for excellent writing. ■5cms X 5cms graph available for writing and drawings. ■Available in all sizes and can be customised also. ■Can be directly installed on the wall very easily. ■Felt can be available in six different colours. Summary: ■Surface material Cork Sheet. Summary: ■Have smooth, economical, non magnetic high pressure laminate with extra elamine coated surface. 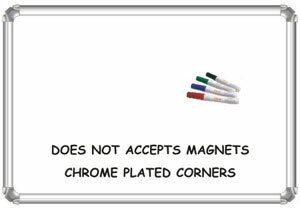 ■Images goes on wet, dries instantly and is removed easily with a standard non magnetic duster. ■Does not attract magnets. Available in white colour for writing with markers. ■Green colour Laminate for writing with chalk. 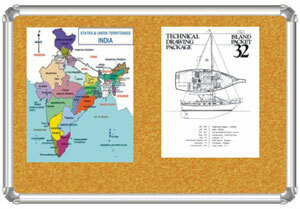 Summary: ■Dual Purpose Notice Board. 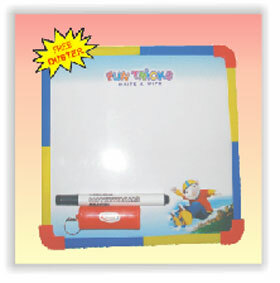 Half Non Magnetic / Magnetic White Board can be used for writing and half for pin up. 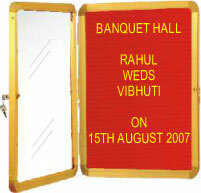 ■Available in all sizesand can be customized also..
Summary: ■Very popularly known as Menu Board/Welcome /Display Board used in Office/Hotels/Auditorium and Public Places for display information. ■Four Brackets provided with each board for direct fixing on the wall. 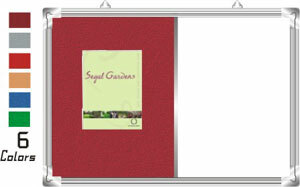 ■Larger size boards are available in multiples of 6 inches. ■Different sizes = 12mm / 18mm / 24mm / 36mm. ■Pastic letter & figures are also available in English & Hindi. Summary: ■Fabric enhances the decor of the office. 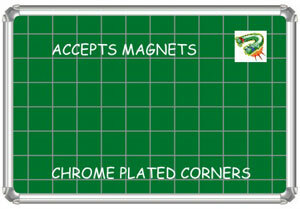 ■Have smooth, economical, non magnetic high pressure laminate surface. Does not evolve dust while writing. ■Available in white colour for writing with markers. & Green colour Laminate for writing with chalk. ■Can be easily Hanged on the wall with wall hanging attachments or counseled clamps. ■Available in all sizes and can be customized. 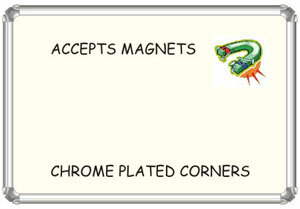 ■Thickness of the surface being 0.40 mm, is totally crack proof and attracts magnets. 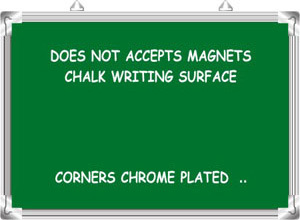 Longer durability than non - magnetic boards for daily usage. Smooth & Glossy surface gives advantage for Excellent writing . ■White colour is available for writing with markers & Green colour for writing with chalk. Summary: ■Ceramic green matt fused on steel surface is passed through various stages of treatment. ■Thickness of the surface sheet is 0.56 mm is non pores and attracts the magnets. 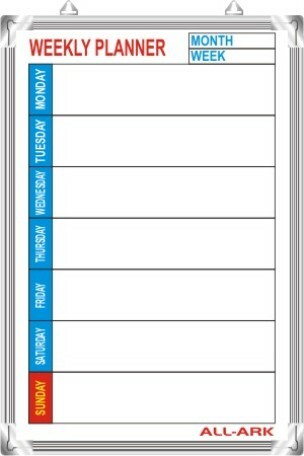 ■Higher & superior quality range of writing boards with lifetime warranty on the surface under daily use. ■Available in white colour for writing with markers & Green colour for writing with chalks. ■Felt can be available in six different colours. Beige/Blue/Green/Grey/Maroon & Red. 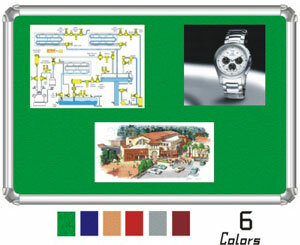 ■Board can be used for writing and half for pin up. 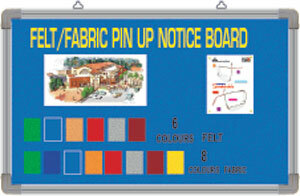 Summary: ■Well Known as SoftBoard/ Pin-up Board Used for display of articles and notices with the help of Push Pins, Drawing Pins etc.... Can be directly installed on the wall very easily. Felt available in six different colours. Beige/Blue/Green/Grey/Maroon & Red. 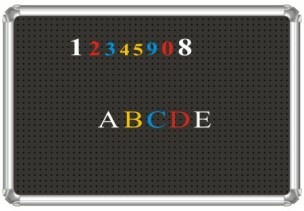 Summary: ■Well Known as Reception Board. ■Used in Lobby in restaurants / Public Places / Sweet Centers / Hotels / Motels for display of room rates, currency exchange rates with the help of Golden Letter & Figures. ■Can be directly installed on the way very easily. ■Velvet available in three different colours. Red / Maroon & Black. ■Available upto sizes 4 x 4 ft.
■Strong Iron Casted Golden Base. Summary: ■Two in One board. 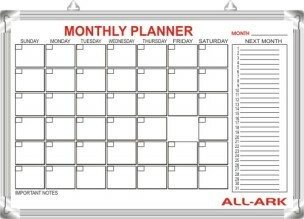 ■Yearly Planner with adjustable magnetic Sunday blocks in red colour. ■Can be easily Hanged on the wall with wall hanging attachments or counseled metal clamps. ■Size : 2 X 3 ft.
■Size : 2 X 3ft. ■Available in protrait & Landscape size. Summary: ■Convenient Way for Storing Keys with Lock. ■Door Cover with locking method. ■Sizes for Storage :- 30, 50, 100 Keys. ■Paper Slip in the Key Chains itself for writing information. Summary: ■Front door covered with alluminium framed acrylic sheet which can be locked with a pair of kyes provided with each board. 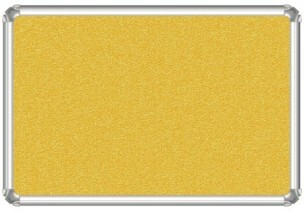 ■The board is backed with a soft board. 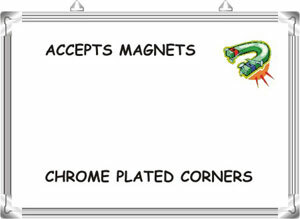 Summary: ■Have smooth, economical, non magnetic surface. 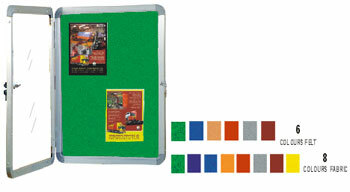 Images goes on wet, dries instantly and is removed easily with a standard non magnetic duster. ■Can be easily hanged on the wall with wall hanging attachments. ■Available In green colour for writing with chalks. 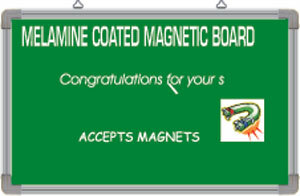 Summary: ■Melamine coated magnetic boards. Extra melamine coating gives smooth & silky writing.Images goes on wet, dries instantly and is removed easily with a standard magnetic duster. Summary: ■Especially designed for Kg & Playgroup Section. ■4 Lines gives accuracy in cursive writing. 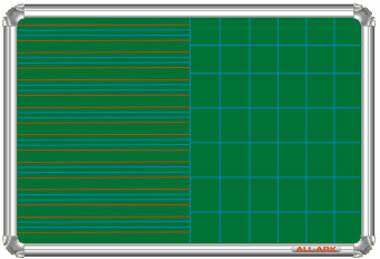 ■Graph can be used for accurate drawing & to write numericals. 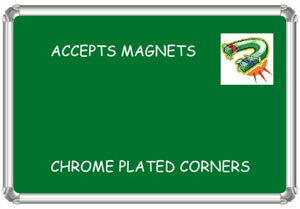 ■Available in Non Magnetic/Magnetic/Ceramic Green Chalk surface only. 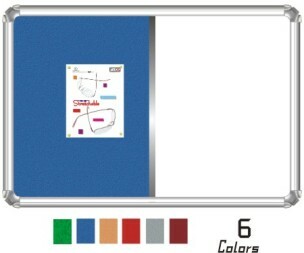 ■Sizes Available : 3X4ft., 4X6 ft., 4X8 ft., 4X10 ft. only. ■One side green chalk board & other sidewhite magnetic board. ■Strong hinges provided for proper locking of the boards on the stands. 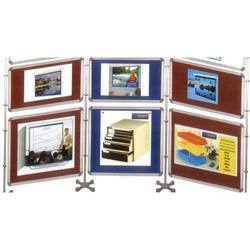 Summary: ■Easy to assemble modular system especially for exhibitions and receptions. ■Heavy duty lobby stands keep the system stable. 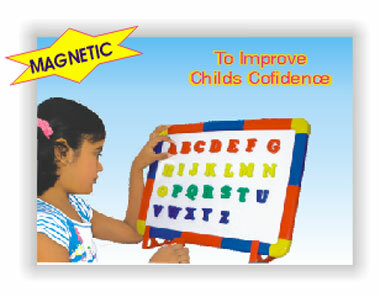 ■Dry wipe Magnetic boards at top to display messages. ■Multi position fitting enables placement of panels at different angles. 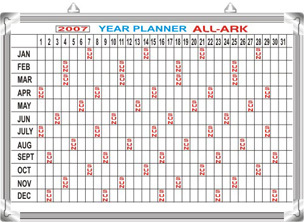 ■The system can be custom made to suit your requirement. ■Can easy assembled on occasion. 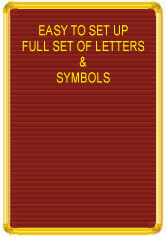 ■Sizes available in 2’X3’ & 3’X4’ Available in fabric/Felt cloth. ■Felt available in six different colours.